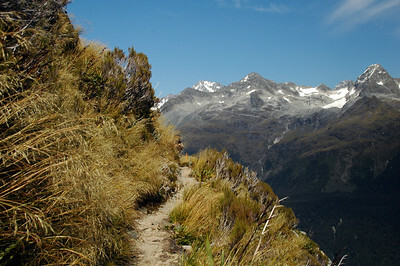 The Routeburn Track on the South Island of New Zealand is designated as one of the “Great Walks” in New Zealand. That means beautiful terrain, awe-inspiring views and luxury (by camping and trekking standards) style accommodation. It also means it’s guaranteed to be expensive and crowded. Ah well. It’s ultimately worthwhile sharing earth’s beauty. And it’s certainly tolerable the way the New Zealand Department of Conservation manages the number of people that come up. The Buckly Transport shuttle picked Derek and me up right outside our hostel the same morning we called and took us from Queenstown directly to the trailhead. Not 20 meters in we crossed a span bridge over some of the clearest water I’ve ever seen. Further up the stream, pools of sunlit water glowed bright blue against the pure white of bubbly, churning water flowing into them. The stark dark shadows of trees spilled in creating a frame with the sparkling rocks around the whole scene. This was a good start. Once in the woods the wide, well-established trail made for easy walking and allowed us to gawk at the surrounding beauty rather than where we placed our feet. An endless carpet of ferns and small lush shrubs covered the forest floor, split only by the meandering white rocky path. Criss-cross patterns of sunlight and shadows floated down from the canopy above. The 6.5km hike to lunch was up a gentle grade along the Route Burn (‘burn’ is another term for river) and onto the Routeburn Flats: a wide bend in the river where flooding has left a very flat bank of sediment between the steeply rising mountains on either side. This oasis unfolded like the opening of a play. The canopy of trees hanging down in front of us along the trail parted like curtains revealing an open grassy meadow, the gentle flowing Route Burn wending through the scene and jagged, tree-covered peaks punching up straight from our feet into the sky. The air felt warm but not so warm that we instantly sought shade to lunch in. We ended up right on the water’s edge, among the tall grass looking upriver, surrounded by the Humboldt and Serpentine Mountains, basking in the sun under a cloudless sky. A gentle breeze would drift through on occasion, rustling the nearby trees, bending the shiny reeds of tall grass, rippling the calm water and cooling the glisten of perspiration on our faces. During lunch we just lay there. Not exhausted from our walk up, not bored by the simplicity of the trail but in perfect contentment and satisfaction. The taste of lunch still on our lips. Another 2.3km, this time gaining 300m, put us at Routeburn Falls Hut, our accommodation for the night. Derek and I come to this trip with a few years of backpacking under our belts. Mostly in the Cascades and the Sierras, hence we packed very self sufficiently with our own shelter, sleeping pads, stove and fuel. None of this was necessary at the hut. Why? Because it was more of a lodge. The fully enclosed bunk room (of which there were two) had thick soft mattresses on each individual bunk. The dining area’s huge picture windows looked out over the valley of Routeburn Flats giving an elevated version the view we had at lunch The kitchen, a half-level up from the dining area, was equipped with at least six cooking stations including sinks with running water and twin burner gas stoves. When we arrived, we sat on a bench on the covered balcony overlooking the spectacular view in sheer amazement. We had wondered when we bought our reservations at NZD 40 ($26) a piece why it was so expensive. Now we understood. Or at least we had a better idea. We also found out we had been extremely lucky. Most people have to book weeks in advance for one of the “hut’s” 40 bunks. We had made our reservations on our day of departure. That evening, the setting sunlight put on a good show of alpenglow on the west-facing peaks of the Humboldt Mountains and in the skies behind them. We sat and enjoyed it all from the comfort of our deck, hot drinks in hand. Routeburn Falls Hut gets its name from the nearby 176m waterfall. The trail we hiked the next morning put us right alongside the roaring upper falls before we popped up into a large hanging valley. Derek and I had gotten a nice early start before most of the rest of the bunk room was awake so the sun was still just streaming across the peaks when we walked through the cool shadows of the valley, occasionally crossing over wooden swamp bridges to stay clear of the marshy parts of the valley floor. We finally emerged into the warm sunbeams as we ascended the western rim of the valley. Lake Harris appeared below us on our left. The water was so clear and calm it practically begged us to jump down the steep 30m embankment to splash around. Fending off that temptation we crested Harris Saddle at 1,255m and could see across the deep gauge of the massive Hollyford Valley all the way to the jagged dark grey Darran Mountains, its stubborn cap of pure white snow ripping into a rich deep blue sky. On the west side of the saddle a substantial emergency shelter sits at the trail junction to the side trip up the 1,515m Conical Hill. Dropping our packs there, we snagged our lunch supplies and made the 260m ascent. Most of the trail was in good shape. Parts of it were steep and required some scrambling, but the 360-degree view at the top makes it very worthwhile. Looking north up the Hollyford Valley, we could see Martins Bay on the west coast. The second half of the day we traversed the steep western slope of Ocean Peak through the knee-high tall mountain grass waving in the breeze. The slope hovered right above us and fell away just as fast below, deep into the Hollyford Valley. After having already logged 11 km that day, we wrapped around a sharp ridgeline and found ourselves looming 300m over Lake Mackenzie tucked away long and narrow like a section of a still emerald green river wedged between the Serpentine and Ailsa Mountains. The descent was steep and it took a fair amount of concentration as we placed our feet. Our legs started to show the early signs of fatigue – making us more prone to stumbling. Derek and I had just come from living on the great plaines of the Polar Plateau in Antarctica. It took some getting used to mountains and rocky trails again. We arrived at the lake mid-afternoon and the hot sun was camped out high in the sky. The sweat was flowing from our pores, soaking our shirts, when we finally made it to the lakeshore. With out any hesitation, I dropped my pack, emptied my pockets, kicked off my boots and plunged into the icy lake. The cold water made me gasp for air and was just what I needed. I peeled my wet yellow trekking shirt over my head and gave it a good rinse in the lake and slowly plodded my way along the rocky bottom back to the lake shore to come out and dry. My amphibious ExOfficio pants have a swimsuit style liner and they drained and dried quickly as I lay out on the shore grass in the sun, once again completely content with the world and all things around me. The bunks in the hut were all booked for that evening so we had reserved a NZD 10 ($6) camping spot. We set up a small tarp as a precautionary measure, but weren’t really expecting it to rain. Another dazzling alpenglow show lit up Emily Peak and reflected in the glass smooth lake. It was a two-for-one sunset. Our last day on the Routeburn, Derek and I were up and moving early again. The morning light started pink on the peaks to our west and purple in the sky. It slowly crept down the face of the mountains changing to orange, gaining luminosity, then blossoming into bright yellow and finally the white light most common to the day. Derek and I were still in the shade traversing along the western slope of the Ailsa Mountains. Every step of the trail offered fantastic views. The 174m Earland Falls cascaded right down onto the trail and it was mesmerizing to look straight up it. A thick carpet of moss, rich and green like natural velvet, covered the rocks where in wetter seasons a greater volume of water spills over. After Earland Falls, we descended into the thicker beech forest, had a short break at Howden Hut and pushed over the final hump past Key Summit and down to the end of the trail at The Divide. We hitched a ride along the Milford Highway to the town of Te Anau. Here, we would re-supply and fly in a small float plane to set out on our next trek, the remote, more desolate, much more difficult and longer, but equally beautiful Dusky Track stashed away in the Fiordlands National Park. This entry is filed under: Australia, Earth, Hike, Story.